If you are experiencing tinnitus, and are on prescription drugs, those drugs might be your culprit. A consultation with your doctor and possibly some tests may confirm that your tinnitus is the result of ototoxic medications, in which case your doctor will most likely switch your medications, unless the risks of doing so outweigh the benefits. 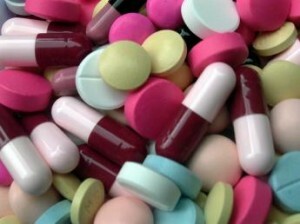 While there are extensive lists of drugs that list tinnitus as a side effect, some have only manifested systems in as few as a single patient; this means two things: do not fret if you have tinnitus and are taking a drug on the list, as it may not be the cause, and two, just because your medication is not on the list, does not mean it couldn’t be a cause of ringing ears. Antibiotics: Several antibiotics have been identified as tinnitus causing medications. Some examples include chloramphenicol, aminoglycosides, erythromycin, vancomycin, and tetracycline. Aspirin is among the most commonly associated with tinnitus side effects. Effects usually appear with regular, heavy use, such as six to ten doses of aspirin per day. Others include some nonsteroidal anti-inflammatory drugs, especially Relafen, or nabumetone, with which tinnitus is reported as a side effect in as many as nine percent of users. Ibuprofen related tinnitus is reported in less than three percent of users. Individuals who take BuSpar, an anti-anxiety medication, report tinnitus as a frequently experienced side effect. Lariam, an antimalarial drug, has some of the highest instances of tinnitus side effects. Methazolamide, also known a Neptazane, Glauctabs, or MZM also has a high percentage of tinnitus reported as a side effect of use. MZM is a carbonic anhydrase inhibitor to treat glaucoma among other uses. Many chemotherapy drugs are implicated in tinnitus cases, including vincristine, bleomycin, mechlorethamine, cisplatin, and methotrexate. Almost seven percent of Xanax users report tinnitus among side effects. Interestingly, Xanax can also be extremely helpful in the treatment of tinnitus. This tranquilizer is commonly used to treat anxiety disorders, but showed efficicacy in the treatment of tinnitus in double blind studies. Careful, though; Xanax can be addicting. Beware of some loop diuretics such as ethacrynic acid, bumetanide, or furosemide. Xylocaine, a local anesthetic in frequent use, has some of the highest percentages of tinnitus in users. It is commonly employed as a dental anesthetic, or for minor surgeries. It is also used topically to alleviate pain from skin inflammations and related burning, itching, and pain.